When F.B. & I stayed at the Manila Hotel for our honeymoon, the hotel had a L'Occitane Verbena travel set. I knew L'Occitane was a pretty expensive brand, so I was excited about the bath products. When I smelled them though... wow! I love the verbena scent! It's a fresh citrusy lime/lemon scent. Amazing! My husband will tell you, I kept putting the lotion on my hands and smelling them, hahaha! Yes, those travel products definitely came with me when we checked out of the hotel. I was happy when we stayed at the Manila Hotel again for our 1st month of being married, because it meant more L'Occitane products! 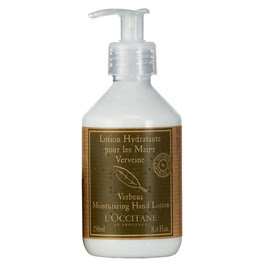 The $3.00 travel sizes (like the hotel had) were out of stock so I ended up getting verbena hand lotion. I also got a verbena soap on a rope. This thing was much bigger than I expected! Definitely worth $10! I've been taking the hand lotion to work and already I've gotten 3 compliments about how good it smells and what brand is it? I'm definitely addicted to L'Occitane's verbena scent! (Darn 5 star hotel! lol!) 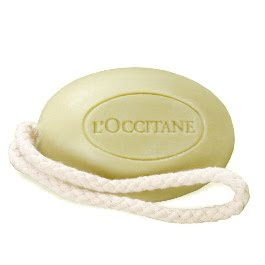 Have you used any of L'Occitane's products?